For a soft, smooth, luxurious glow, this nutrient-rich elixir is made with both Vitamins C and E. It was created for your hair to the tips of your toe and everywhere in between. The world's fines botanical oils have been included in the formula including sunflower, meadowfoam, camellia, ylang ylang, sea buckthorn and elemi which combine with botanical extracts of arnica, comfrey and chamomile to nourish, moisturize and protect the skin and hair. It benefits all skin types and is all natural. Make sure not to put too much on though or it won't sink into the skin and you will feel like you have have an oil slick on your skin. I especially like to use it at night on my skin instead of anything else. I just put this on and go to bed to wake up with the softest skin imaginable. 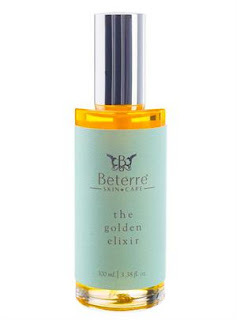 Bétèrre Skincare is sold online at www.beterre.com.Like Bétèrre on Facebook : https://www.facebook.com/Beterre-SkinCare-1610411009244743/; Follow Bétèrre on Twitter:@beterreskin; Follow Bétèrre on Pinterest:https://www.pinterest.com/beterreskin/ and Follow Bétèrre on Instagram:https://www.instagram.com/beterreskin/ .